Is your home lacking elegance and decor? Lighting is a wonderful way to create a desired atmosphere in any home and brightening them up or dimming them down can really set the mood. Different rooms serve different purposes and by choosing the right lighting scheme any room can change from a relaxing getaway to an intense party place. Recessed lighting and UCLs: this kitchen shines underneath recessed lighting in the ceiling and under cabinet lights (or UCLs) really accent the counter tops. Perfect for this fresh, bright kitchen design that encompasses white cabinets. Contemporary feel: lamps are used throughout this bedroom to create a contemporary look. Placed on both night tables and in the corner of the room, these beautiful lamps create a cozy mood - perfect for relaxing after a long day of work. 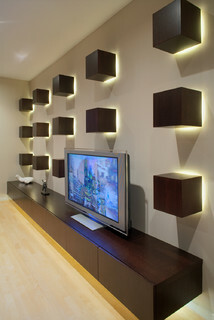 Modern Family Room: in this family room, modern light boxes are used to make a bold statement. The homeowners wanted a TV as well as an attractive clean and modern statement for their family room. Contemporary Home Theater by Ann Arbor Architects & Building Designers Wright Street Design Group Inc.
No matter what kind of design you wish to incorporate in your home, our highly skilled electricians will get the job done BRIGHT! At GEN3 Electric our technicians are trained on how to help a homeowner choose the right lighting for your unique tastes as well as how to install lighting safely to make any home feel warmer and more inviting. Give us a call today!